We have museums for all ages and interests here in Gettysburg – and the good news is that they won’t break the bank! Many people like to begin their trip with a visit to the Gettysburg National Military Park Museum & Visitor Center Film, Cyclorama and Museum Experience. For under $20 you can explore the artifacts found in the museum, watch an overview of the battle on the big screen and admire a 360-degree painting with a light and sound show. If you’re looking for a unique take on the battle, Civil War Tails is for you. There you’ll find several battle scenes portrayed as dioramas with cat soldiers! Perhaps, your interests lie beyond Civil War history. The National Apple Museum may be a good fit for you, where you’ll learn about the history of the fruit industry in Adams County – the largest apple producing county in Pennsylvania. In Gettysburg, we know a lot about preservation and restoration. There are so many beautiful homes and landmarks that are kept historically accurate so that visitors can learn about the incredible history and see first-hand what it must have been like to live here during the time of the Civil War. Visit the place where the only civilian died during the Battle of Gettysburg – the Jennie Wade House Museum. The bullet hole from the fatal shot can still be seen in this historic home. If you want to learn about Gettysburg’s history beyond the Civil War, plan a stop to the Eisenhower National Historic Site. See President Dwight D. Eisenhower’s retirement home decorated just as First Lady, Mamie Eisenhower, had it when they lived there. The town of Gettysburg and the battlefield carry so much history, it can be difficult to know where to start. The Gettysburg Driving Tour and the Gettysburg Field Guide by TravelBrains driving tour allow you to learn about the famous battle at your own pace in the comfort of your own car, and for under $20. For lesser known stories, consider a Historic Church Walking Tour. On this tour you’ll visit eight downtown churches – many of which had deep involvements in the Civil War. A guided tour with American Stories Historic Walking Tours & Programs are also under $20. Go back in time as stories from the Civil War are brought to life. It’s important that our youth understand Gettysburg’s history, and many of the experiences mentioned above are perfect ways for children to get hands-on in Gettysburg. 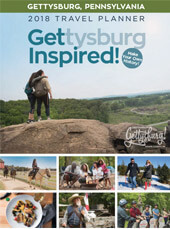 However, if your child wants a break from history, Gettysburg has plenty of budget-friendly, family-friendly activities. Take them to Land of Little Horses, a 100-acre farm with animals of all kinds. They’ll see horses and donkeys, pigs and goats, even emus! And don’t miss their special animal show programming throughout the day. If your youngster loves to get their hands dirty and make a mess, take them to Explore & More Children’s Museum. Here, they are encouraged to get messy with arts and crafts, painting, fun experiments and dress-up. At Under the Horizon, kids and adults can create and take home their own pottery creations for under $20. Handmade souvenirs are often the best ones! For the soulful and meditative visitor, Down Dog Gettysburg is a must-stop. Find your Zen at a peaceful yoga class for under $20. All skill levels are welcome! And for our adults that need to get away from the stresses of everyday life, the Adams County Pour Tour was created for you. Get your free passport and trail map at any participating location and taste your way through Gettysburg and Adams County. Most stops along the trail offer free or low-priced tastings, free live music and great company. While you’re popping in and out of wineries, breweries, distilleries and cideries along the Adams County Pour Tour, stop in some of Adams County’s countryside farm markets. You can pick-your-own produce, take orchard tours and sample some local goodies. If you’re looking for more budget-friendly ideas, check out this list of FREE things to do in Gettysburg! We’ll see you soon!